Ornithine is a non-essential amino acid, meaning your body can produces it, and you don’t have to rely on diet alone for your supply. Ornithine makes up part of ornithine alpha-ketoglutarate, a compound that regulates the release of growth hormone -- a compound that, as the name implies, promotes tissue growth. Although you generally don't need ornithine as part of your diet, several foods can help boost your intake. Red meat, chicken and pork all contain ornithine. 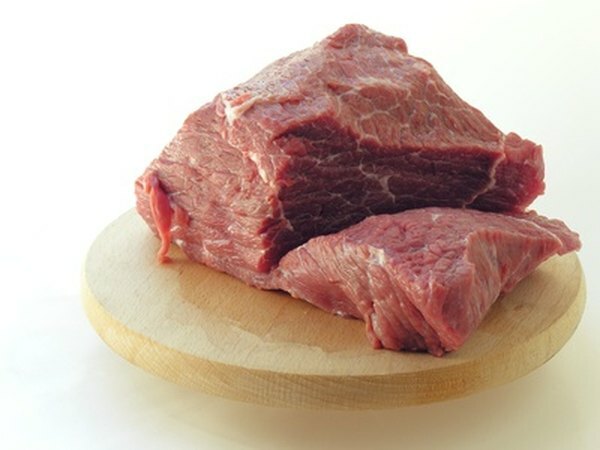 When purchasing meat, look for leaner cuts to avoid high fat content, or trim the fat before you cook it. Many meats contain saturated fat, which is responsible for clogging arteries and contributing to heart disease. Prepare meat healthfully for optimal health benefits. Cook it without the use of added oils, and forego sauces that boost your calorie and fat intake. Eggs serve as a vegetarian-friendly source of ornithine. In addition, eggs contain protein, tryptophan, selenium, iodine, vitamin B2 and vitamin B12 -- nutrients important for a healthy metabolism, as well as proper brain function. Hard-boil, poach or steam your eggs for optimal heath benefits -- these cooking methods don't require added oil, so you'll get a high-protein but low-fat meal. Consume dairy as a source of ornithine, as well as other nutrients such as calcium and vitamin D needed for strong bones, vitamin A beneficial for healthy vision and vitamin B-12 needed for red blood cell function. Dairy products include milk, yogurt, cheese and butter. Consider using skim and low-fat versions to minimize fat content -- full-fat dairy products come loaded with saturated fat. Eating fish is a good alternative to heavier meats, if you still want to consume some ornithine and protein. Prepare fish by broiling or baking instead of frying, so you can reduce the fat content. Choosing oily, cold-water fish, like salmon, mackerel and sardines, will ensure you get a healthy dose of omega-3 fatty acids, too. These healthy fats protect your cardiovascular system, and might also play a role in preventing or treating arthritis.